Each neuron a computer, the brain a vast network? Modeling the neuron as little more than a simple on/off switch is a big mistake (Image: Dan Webber). 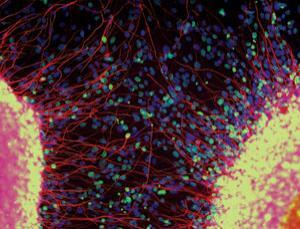 So where does that leave the neuron, the most highly evolved cell we know? It ought to be in an interesting and privileged place. After all, neurons are so specialized that they have virtually abandoned division and reproduction. Yet we model this cell as little more than an organic transistor, an on/off switch. But if a red alga can "work out" how to solve problems, or an amoeba construct a stone home with all the "ingenuity" of a master builder, how can the human neuron be so lowly? Unraveling brain structure and function has come to mean understanding the interrelationship between neurons, rather than understanding the neurons themselves. My hunch is that the brain's power will turn out to derive from data processing within the neuron rather than activity between neurons. And networks of neurons enhance the effect of those neurons "thinking" between themselves. I think the neuron's action potentials are rather like a language neurons use to transmit processed data from one to the next. Back in 2004, we set out to record these potentials, from neurons cultured in the lab. They emit electrical signals of around 40 hertz, which sound like a buzzing, irritating noise played back as audio files. I used some specialist software to distinguish the signal within the noise - and to produce sound from within each peak that is closer to the frequency of a human voice and therefore more revealing to the ear.